Lincoln will re-join this conference in 2019. Missouri Southern State, Missouri Western State, and Fort Hays State used new helmet designs in 2018 (shown above). This school's name was changed from Central Missouri State University to University of Central Missouri on September 20, 2006. *1 A slightly different design was used for CMSU's appearance in the December 12, 1970 Pecan Bowl game against Arkansas State in Arlington, Texas - two white stripes were used alongside the middle red stripe. *2 The first of these two helmet designs was used during at least the 1978 and 1979 seasons, while the second was in use during at least 1981 and 1982. The 1980 helmet design may have been one or the other of these two, but a visitor to this site has suggested that the 1980 design was probably a hybrid of the other two - a decal like that used on the 1981 helmet worn on shells of the color used in 1979. *3 The stripe sequence may have varied during the years when this design was in use; specifically, there may have been some years during which the white and black stripes bordered directly against each other (rather than having the red "gap" as shown here). *4 During the 2004 season, the word "MISSOURI" in black letters was added inside the "tail" extending beneath the word "Central". *5 Uniform numerals are worn on the left side only of this design; on the right side is a "C" logo (as shown below). *6 Uniform numerals are worn on the left side only of both designs 'E' and 'E1'; on the right sides of these designs are two different logos: 'E' has a "mule head" logo with a mirror-like "color", while 'E1' has a mirror-like "C" logo. Below are representations of these designs. *7 Uniform numerals are worn on the left side only of both designs 'F' and 'F1'; on the right sides of these designs are two different logos: 'F' has a new logo consisting of the team name "MULES" in front of a horseshoe; below is a photograph showing this helmet logo. I have been unable to locate a copy of the artwork for this logo, which I will need in order to add this one to the website. Design 'F1' has a logo like that worn on both sides of design 'D' shown above (the 'F1' logo may be silver/mirror-like rather than white). *8 Uniform numerals are worn on the left side only of this design; on the right side is a "mule head" logo with an American flag coloration (as in helmet design 'B' above). *9 Uniform numerals are worn on the left side only of this design; on the right side is a "C" logo (as shown below). *1 Worn during the 2011 home game against Lindenwood. *1 In 2011 the numerals are being worn on the right sides of the helmets only, with the left sides remaining "blank". During the late 1980s Missouri Southern State used a logo consisting of white, block-style letters "M" and "S" inside a green oval shape; this was worn on yellow helmet shells. I have not received much information about other earlier helmet designs for this team. *1 For the 2011 season the MSSU helmet logo was modified to memorialize the victims of the Joplin tornado of May 22, 2011, which claimed an estimated 162 lives. The intersecting acronyms "JOMO" (for Joplin, Missouri) and "MOSO" (for Missouri Southern) were added to the interior of the logo, as well as "5/22" and "5:41", the date and time of the tornado's arrival at Joplin. *1 Uniform numerals are worn on the left side only of this design; a large "griffon" logo adorns the right side (as represented below). *2 Uniform numerals are worn on the left side only of this design; a large "griffon" logo adorns the right side (as represented below). 1990 1991 - 1999 2000 - 2010? *1 Worn during the 2014 home game vs Washburn. I have received some partial information about earlier helmet designs used by NSU: during the 1960s, the team used plain silver helmets with a single green stripe; during the 1970s, a switch to green helmets was made, and a new logo, a white arrowhead containing the letters "NE", was used. In 1979, the "NE" was replaced by an "NSU" logo similar to the one used by the team during the early 2000s, still inside a white arrowhead. I would appreciate photographs of any of these earlier designs. *1 The 2014 helmet design featured numerals on the left side only; on the right side was a large "hawk head" logo (as depicted below). In January 2009 I received a large number of photographs of old NWMSU helmets (thanks David), which allowed me to partially document the team's helmet history back to 1961. Unfortunately, few of the photographs are in color, so uncertainties remain about what color the various helmet features were. While the team has apparently used green helmets since 1972, I do not know if the helmets have always been dark green (like the current design) - they presumably could have been a lighter shade during earlier years. The team colors were originally red and white, but I have been informed that the switch to the current colors (green and white) was made many years before 1960. Some helmet designs have also feature gold or yellow elements. Through the 1960s the helmets apparently always had white shells. There was a single dark stripe on the helmets in 1961 and 1962, but from 1963 through 1966 the dark stripe was apparently flanked on either side by a lighter-colored stripe (probably gold). Also from 1963 through 1966, uniform numerals in some dark color were worn on the helmets. Two oval-shaped helmet logos were used from 1967 through 1971 - one containing an "M", and the other the letters "NW State". 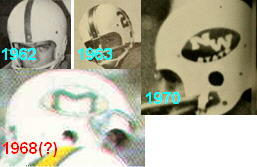 Below are photographs of the helmet designs known to have been used from 1961 through 1971. The team apparently switched to dark-colored (probably green) helmets in 1972 (the 1977 NWMSU yearbook refers to the team as the "green and white"), possibly with one or more light-colored stripes during this first year. The helmets were apparently "plain" (without logos or stripes) from 1973 through 1978. In 1979 an arched "BEARCATS" logo was adopted, and used through 1982. In 1983 the team switched to a script "Cats" logo, which was used through at least 1993, though possibly not for all games, and with a few different stripe combinations. Below are photos showing the two helmets logos used from 1979 through 1993. During at least part of the 1995 season, another interesting helmet logo was used (see photo below) - this one featured the letters "NW" atop a "paw print". *1 This design was used during the home game against Truman State in 2005 as part of an observance of the university's centennial. *2 A red version of the traditional paw print logo was first worn during the 2011 home game against Fort Hays State; this was done as a tribute to former NWMSU head football coach Scott Boswick, who died on June 5, 2011. As an assistant coach at NWMSU Bostwick had habitually worn a red cap to enable his players to locate him easily on the sideline amongst all the green. This design remained in use through the 2011 season. *3 The numerals '52' were worn on all NWMSU helmets during the November 4. 2017 game against Fort Hays State in honor of former team member Nicholas Turner, who had died suddenly in January 2016; 52 had been Turner's uniform number. The '52' was worn on the left side only of each helmet; a black version of the 'paw' logo was worn on the right side (as represented below). This college was known as Kansas State College of Pittsburg prior to April 21, 1977. During the 1961 season, the team was using the helmet design visible in the very small photographs below; it would appear that the helmets were probably silver or gold in color, and had at least two dark stripes. At another point during the early 1960s, the team wore white numerals on red helmet shells with gray faceguards. I am not aware of PSU having ever used any helmet logo other than the current script "Pitt", but I have received very little information for this team from the 1960s and 1970s. *1 Worn during the 2012 home game vs Central Oklahoma and during the 2012 game vs Northwest Missouri State played at Kansas City, MO.